One man’s trash is another man’s treasure—especially when it comes to the knowingly lurid thrills of Greta, which is part psychological horror film and part campy hoot. Director Neil Jordan merges Hitchcock-ian suspense with the tacky pleasures of those original movies Lifetime airs on Saturday nights—the ones where unsuspecting female characters watch their lives endangered by seemingly friendly forces, like a babysitter or a police detective. What’s meant to be delightful about Greta is that we “get” that, on one level, the whole thing is supposed to be over-the-top—and that, at the same time, we’re always appreciating the amount of skill, craft, cunning and art that’s been poured into the mix. There’s a natural tendency to want to like Greta so that you don’t feel like a killjoy or a snob. But as much as I appreciated Jordan and his actors’ balance of high and low, I rarely treasured its trashiness. The film’s premise could have been inspired by a nightmarish urban legend. A young woman recently moved to New York, Frances (Chloë Grace Moretz), discovers an unattended handbag on the subway. Because Frances is a kindly sort—her rich roommate Erica (Maika Monroe) is less generous, calling her naïve—she tries to return the bag to its rightful owner, which brings her to the home of Greta (Isabelle Huppert), a sweet, lonely widow who’s grateful for this stranger’s thoughtfulness. Soon, they start spending time together, seeing in the other something missing in their own lives. For Frances, it’s a surrogate mother after the recent passing of her own mom. For Greta, Frances is a substitute for the distant daughter who now lives in Paris. But things prove too good to be true for Frances, who learns that her new friend may have a secret, sinister agenda. And, to be sure, it’s a treat to watch Huppert risk falling on her face in the name of this outrageous thriller, which wants to ply us with horror-movie scares on top of serious themes about the terrors of motherhood, grief, loneliness and dependence. Ace Atonement cinematographer Seamus McGarvey gives Greta a dark-hued grandeur and a cold sterility that’s chilly and classy in equal measure. And Jordan’s calm, tense precision sets us up early on to prepare for the rug to be pulled out from underneath us. But while we suspect that bad things await Frances as a result of her charitable act, we don’t quite know how those consequences will play out—and we sure aren’t prepared for the stylistic shifts coming our way. What begins as a stately, somewhat stilted character study soon morphs into something juicier and more deranged. Greta is indeed lonely, but precisely what she has in store for her new friend goes far beyond the borders of reasonable comportment. And Greta follows her straight down into the dark hole of her psyche. Jordan tries to upend the tenets of woman-in-peril melodramas, offering a tonier version of 1990s multiplex junk like The Hand that Rocks the Cradle or Single White Female. But whether it’s Javier Navarrete’s cheekily hyperbolic score or the story’s escalating preposterousness, Greta also enjoys nudging us in the ribs, constantly reminding us that the film knows it’s ridiculous—and that we should feel free to relish in how silly/scary it is. How one responds to such an invitation, I suspect, will be deeply specific to the individual—a Rorschach test of sorts for one’s tolerance for winking, cheesy trash. If Greta had more of a foundation—if I felt there was much girding the over-the-top shamelessness—then I probably would have been happier to play along. Actually, a film like Ella, with its combination of sleaze and seriousness, is instructive by comparison. A director such as Paul Verhoeven deeply loves the genres he plunders, amplifying their pulpiest qualities to tell bold, emotional stories with a philosophical undertone. But Greta feels a little too studied—a little too constructed—to be as garish and vibrant as it desires. It’s a film “about” Hitchcock flicks, horror-movie monsters, and dime-store thrillers without fully absorbing their lessons or pleasures. Not that Huppert doesn’t give her all. There’s a wickedness (and more than a little glee) to her performance, as if she can’t quite believe she’s getting away with such a broad turn. And yet, there’s also a control that keeps us on edge around Greta: She’s probably crazy, but she’s composed enough that we can’t predict where her insanity will take us next. Moretz isn’t quite as convincing, basically becoming the damsel in distress desperately fighting her way out of Greta’s ingenious trap. Legitimate real-world anxiety permeates Greta—Frances quickly realizes how useless the police are for a helpless young woman pursued by a persistent but nonviolent stalker—and as the film drifts further to the extreme, one could read the whole enterprise as a worst-case scenario of what happens when women’s fears are ignored by those around them. But Frances doesn’t have the depth to be much of a tragic heroine. 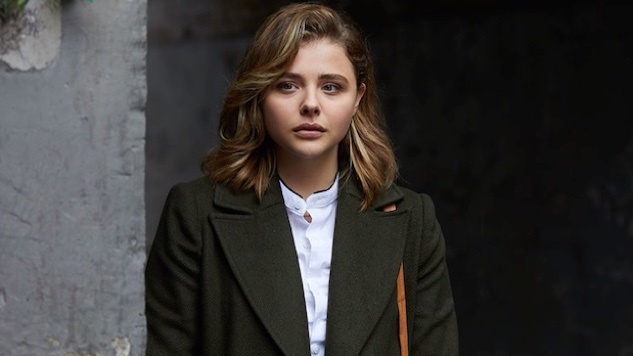 Just as her character is held hostage by Greta’s steely will, so too is Moretz overmatched by her costar. Stuck between them is Jordan, who doesn’t want us to take Greta too seriously but nonetheless hopes we appreciate the sly crosspollination of tones and genres he’s orchestrated. I’m clever enough to recognize the film’s formal strategies and cinematic in-jokes. But clearly I’m too much of a killjoy, because I kept hoping all that slyness would ultimately amount to a better movie.